March 20, 2013 By This post may contain affiliate links. The Easter Bunny will be excited to get his paws on these delicious Easter Carrot Top Cupcakes! 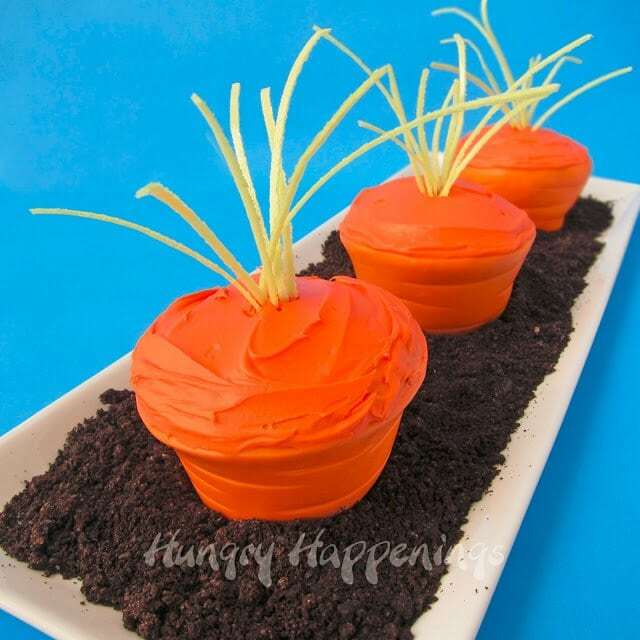 Each chocolate cupcake looks just like a real carrot popping out of dirt. 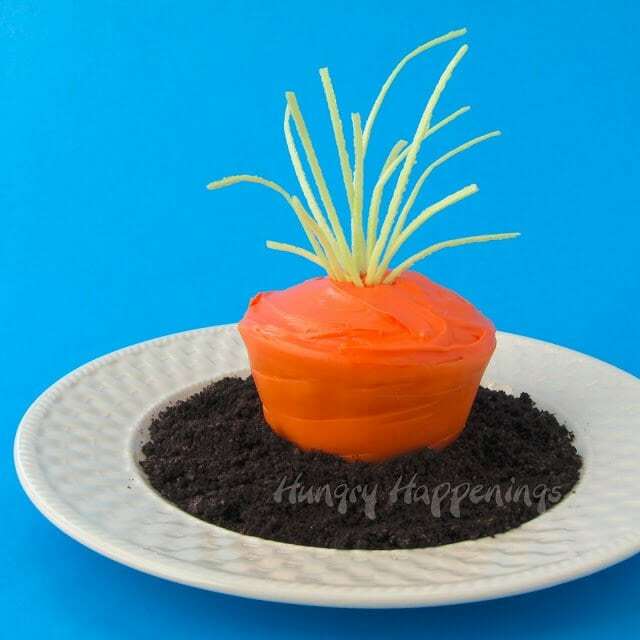 The cupcakes are wrapped in orange chocolate clay, are topped with orange frosting and sprigs of edible grass, and are served in chocolate cookie crumb dirt. Cakes are often completely covered in fondant but you don’t see too many cupcakes decorated that way. Why not? Probably because fondant is way too sweet or just plain awful tasting, but an alternative, modeling chocolate, tastes, well, like chocolate, and works almost exactly like fondant. What’s not to like about that? 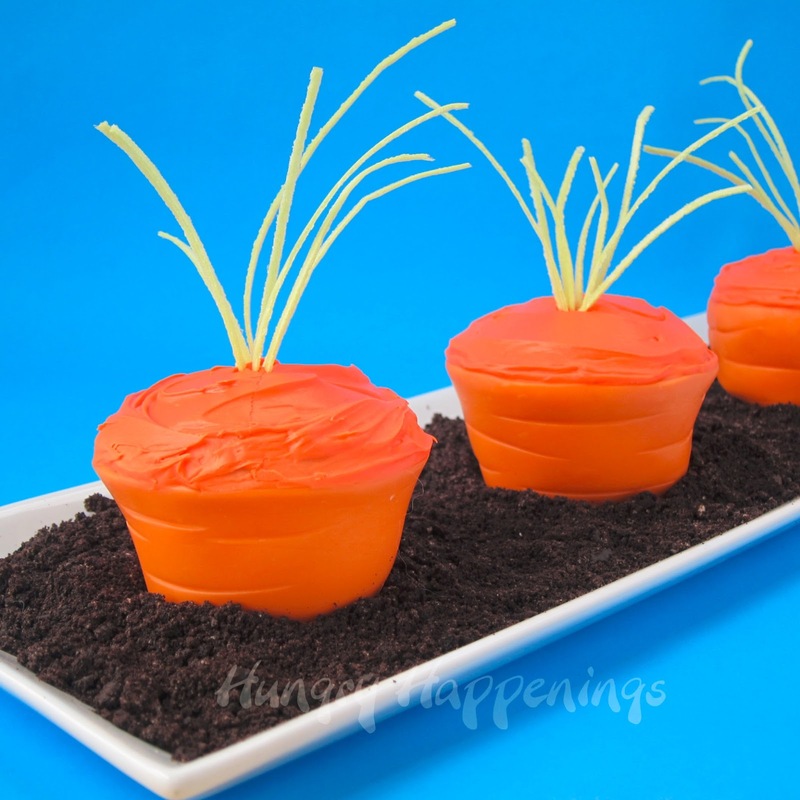 These burning questions got me thinking about clever ways to make and use modeling chocolate cupcake wrappers for Easter and these Easter Carrot Top Cupcakes were my first experiment. It’s always so wonderful when my first try at something works. I had three recipe flubs earlier this week, so these made me so happy. Edible cupcake wrappers offer so many fun possibilities and I am sure you will be seeing more of them here at Hungry Happenings. Their only downside is that they do take away some of the purpose of making cupcakes, and that is eating the tiny cakes with your hands. The wrappers will melt, so you’ll need to serve your cupcakes on a plate. This problem actually worked in my favor with this project. My Easter Carrot Top Cupcakes needed to be in dirt anyway, so I poured some chocolate sauce on a plate, added a sprinkling of crushed Oreo Cookies and set a cupcake on top. 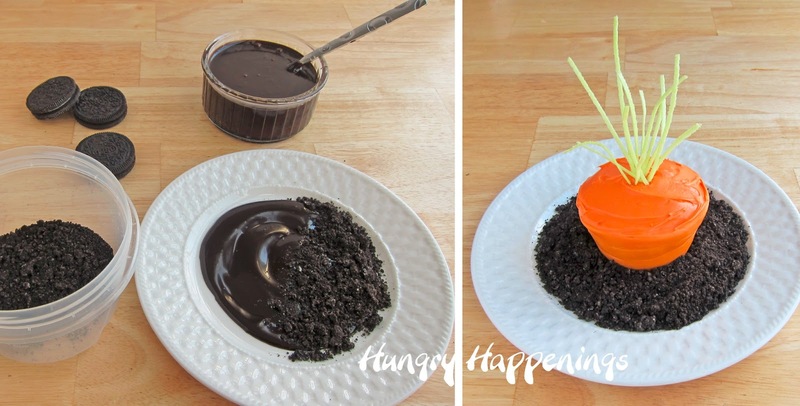 Not only does the edible chocolate dirt compliment the look of the cupcake, but it also adds layers of flavor that turn an ordinary cupcake into a special dessert for Easter. Each cupcake is wrapped in a strip of orange modeling chocolate, topped with orange frosting, and has a wisp of edible candy grass sticking up out of the top. In person the edible grass has more green color, but each strand is so thin it shows almost transparent in pictures. If you’ve never made modeling chocolate, it only requires two ingredients and comes together pretty quickly. Read my modeling chocolate recipe and all my tips on my Chocolate Making Tips page before you begin. *Chocolate Ganache Recipe – Scald 1 cup heavy whipping cream stir in 8 ounces chopped chocolate until melted. Allow to cool until slightly thickened. 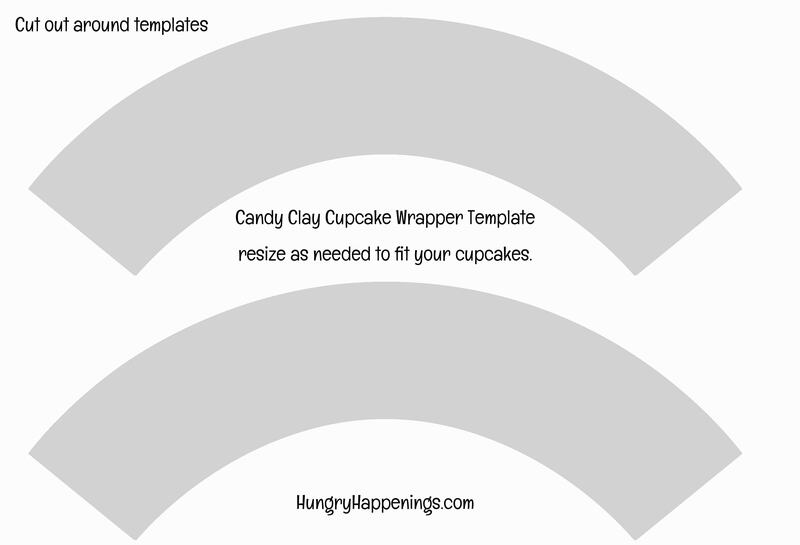 Go here to get a copy of a cupcake wrapper template. Set it in your muffin tin to see if it is the right size. Adjust the template as needed. I found that my muffin tins aren’t all the exact same size. I had to add length to my template and cut 1/4 inch off the width. Be sure to use the same muffin tin to make your cupcakes as you do to make your edible cupcake wrappers. TIP: I have finally found the perfect way to roll out modeling chocolate without having to dust your work surface with powdered sugar, which can be messy and make your modeling chocolate dry. Roll it out on a non-stick mat. It works great! Roll out the orange modeling chocolate. 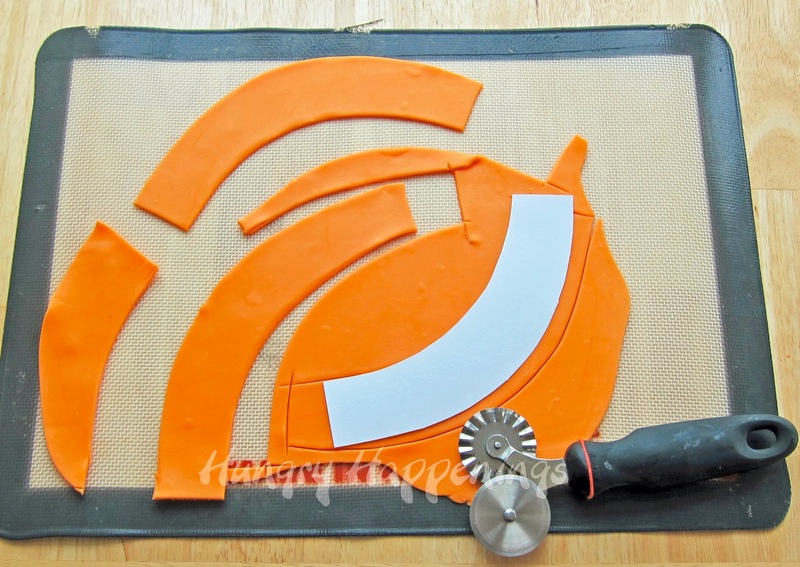 Set a cupcake wrapper template on the modeling chocolate and use a pizza cutter or knife to cut out around the template. Be careful not to cut your non-stick mat. Set each modeling chocolate cupcake wrapper in your muffin tin. Use corn syrup to glue the two ends together. 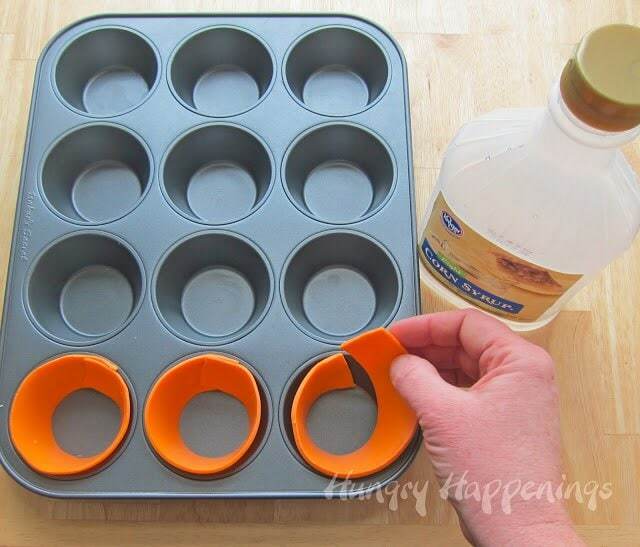 Allow your edible cupcake cups to dry for at least an hour in the pan. Set a cupcake in an edible modeling chocolate cupcake wrapper. 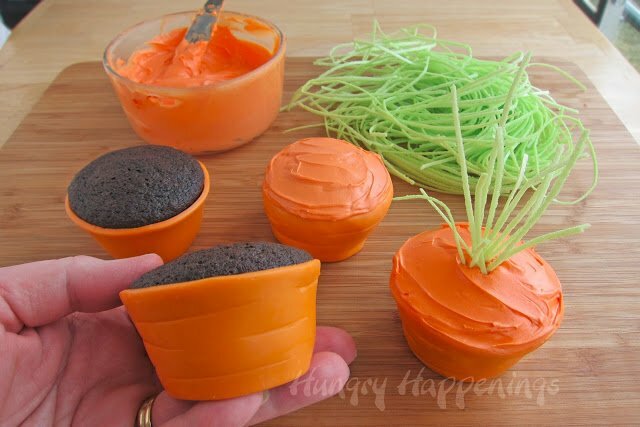 If you want, you can spread a bit of frosting on the outside of the cupcake before placing it in the wrapper, but it’s not necessary.Use a knife or metal spatula to create indentations across the cups to give the carrots a more realistic look. Frost the tops of your cupcakes with orange frosting making sure it goes all the way to the edge. Cut edible candy grass at varying lengths and stick them in the center of each cupcake top. Spread some chocolate sauce or chocolate ganache on a dessert plate. Sprinkle on some crushed chocolate cookies. 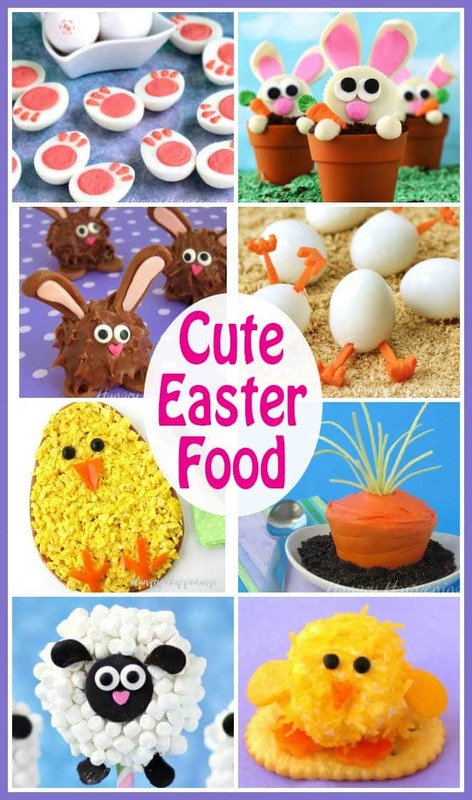 Set an Easter Carrot Top Cupcake in the center of each plate. I do recommend making these they day you serve them for the best results, but you can make these ahead and store them in an airtight container for a few days. The modeling chocolate will soften in the container, so be careful lifting them out to plate them. If this Chocolate Ganache interests you, then you should go and check out all these other delicious ideas. Oh My word! I heart you! Love these Beth! So clever! my pleasure, i love your ideas!! beth that is so cool! what a great idea! i love the idea of carrot cupcakes (that are *chocolate* 🙂 ) for Easter!! 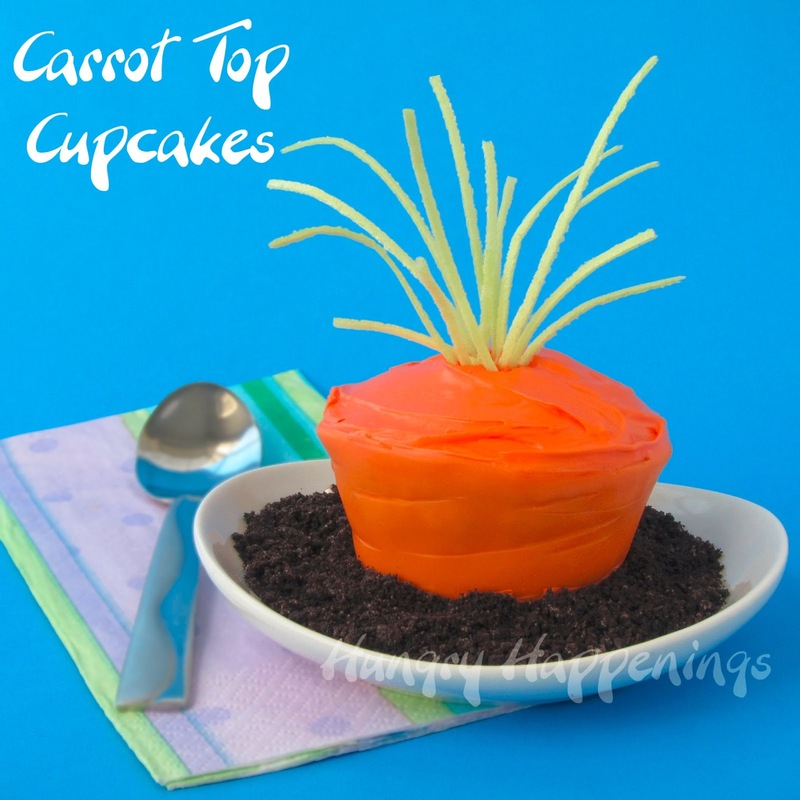 Beth – these are just fantastic – love how you wrapped the carrot cupcake! Looks just perfect! These cupcakes are fantastic! They would look so cute on the Easter table. I've never worked with modeling chocolate before, but it looks so cute, I might have to give it a try. The texture on the wrapper tips the cuteness over the top! what a totally clever idea! I LOVE it!! These are adorable. I might have to give this a try! Ok, these are adorable! What a creative idea! Blessings to you! These are so stinkin' cute!! I keep seeing them around….thought I'd come check them out! Thanks for sharing such a great idea! !